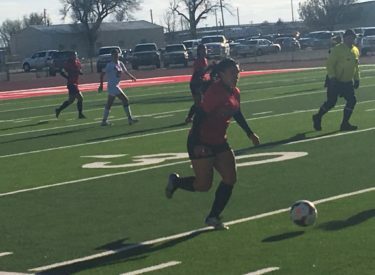 The Liberal girls soccer team rallied to defeat the visiting Great Bend Panthers 2-1 Thursday night at the Gary Cornselsen Sports Complex. Great Bend scored first. They scored on a free kick with a little over two minutes remaining in the first half. Liberal has the wind at their back and possessed the ball on Great Bend’s south side of the field most of the second half. Jasmine Hernandez tied the game with 30:18 to play thanks to an assist form Kim Alarcon. Gisselle Melendez gave LHS the lead with 10:18 to play. Liberal improves to 3-1 in the WAC and Great Bend is 4-4-1. The Lady Red hosts Thomas Moore Prep Tuesday and Hays on Thursday at the Gary Cornelsen Sports Complex. Liberal sweeps the season series with Great Bend.